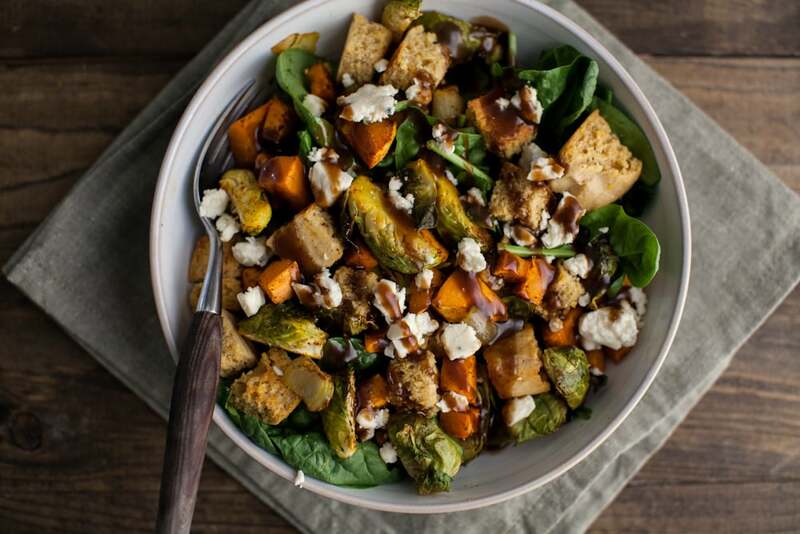 The title that was too long but actually describes the salad: Roasted Sweet Potato and Brussels Sprout Cornbread Panzanella Salad with Blue Cheese and a Maple Mustard Vinaigrette. A bit wordy, huh? I’ve been staring at Laura’s many awesome panzanella salads (I think she’s the queen of these salads) and then I saw Ashley post a cornbread version (gluten-free too!) I couldn’t resist making a fall version with cornbread because let’s be honest, I love cornbread. All the cornbread that didn’t go in the salad? I ate. Smeared with butter and honey. Preheat oven to 350˚ and lightly grease an 8×8 pan. Combine pastry flour, cornmeal, baking powder, and sea salt in a bowl, stir to combine. In a separate bowl, whisk together eggs, maple syrup, walnut oil, and milk. Pour into dry ingredients and stir until batter is combined. Pour into prepared pan and bake until golden and springs back when pressed, 25-30 minutes. Let cool slightly. Once cornbread has cooled, carefully cut cornbread into 1/2″ cubes and place 2 cups of the cubed cornbread into a bowl. Add 1 tablespoon olive oil and rosemary, tossing until cornbread is covered. Place on a baking tray and return to oven. Bake for 13-15 minutes until cornbread is firm and toasted, stirring halfway through. To roast vegetables, peel and cut sweet potatoes into 1/2″ cubes. Toss with quartered Brussels Sprouts, onion, 1 tablespoon oil, salt, and pepper. Place in the oven and roast until vegetables are tender and browning, 40-50 minutes. While everything bakes, combine olive oil, balsamic vinegar, mustard, and maple syrup in a jar with a lid. Shake well until dressing is combined. 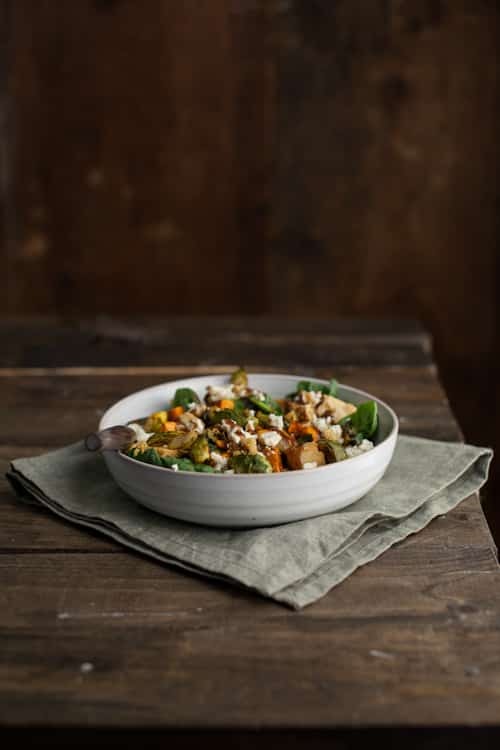 To serve, combine roasted vegetables, toasted cornbread, spinach, and blue cheese in a large bowl. Drizzle dressing on top and toss until everything is well coated. *Cornbread had be made the day ahead. However, I’ve also been known to bake the cornbread, let cool slightly, and then re-toast all while the vegetables are roasting. panzanella salads are the best! cornbread, maple, and mustard are also the best! this recipe rocks so hard. Well that’s what I call a fall dish! that looks amazing! i just might have to use my leftover roasted butternut squash instead of sweet potatoes. yum! 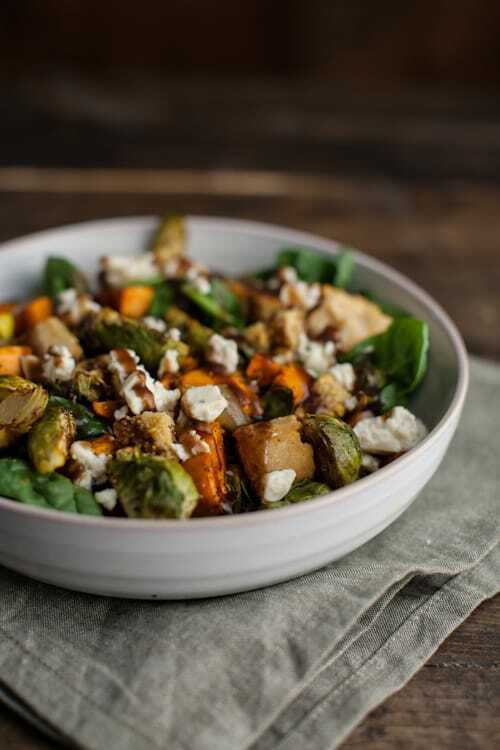 So many delicious roasted vegetables in this dish! So pretty and I love a cornbread panzanella! So my kind of fall meal! This salad is chalk full of awesome! YUM! Hey, I love cornbread too. I imagine it’s pretty fantastic in panzanella form. I also love the list of ingredients in your cornbread! This will definitely be making its way into my dinner rotation soon! I could eat panzanella all day long! Especially with cornbread croutons! And all of my favorite roasted fall veggies. 🙂 That’s a good choice too! Lovely recipe. I make a very similar dressing and I can’t get enough of it. Perfection! I just made this for dinner last night and it has become an instant favorite in our house! Made this for dinner tonight. Wow! Just wonderful. This one is a keeper.